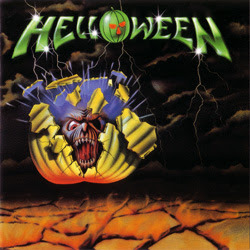 The Helloween EP is the debut recording by the German band Helloween. Even though it wasn't a power metal album it was very significant for the genre. Helloween formed in 1984 in Hamburg, Germany. The original line-up included Kai Hansen on vocals and guitar, Michael Weikath on guitar, Markus Grosskopf on bass, and Ingo Schwichtenberg on drums. That year, the band signed with Noise Records and recorded two songs for a Noise compilation record called Death Metal. The compilation featured the bands Hellhammer, Running Wild, and Dark Avenger. The two tracks were "Oernst of Life" by Weikath and Hansen's "Metal Invaders," a faster version of which would appear on the band's first full-length album.